How Blue is our Planet? is a compelling collection of short stories for young readers. One can effortlessly fathom environmental sustainability through these narrations. Bagli has woven stories around simple but a wide range of planet life. The call for eco-balance is portrayed not only through bird and animal life on earth but also through the insects that live underground. The 16 stories can be broadly grouped into two categories. One that describes the different topographical areas and the life therein like the mountain ranges in ‘Avalanche’, sea life in ‘The Hungry Sea’, desert life in ‘A hair rising story’, rural life in ‘The exodus’, caves in ‘Caved In’, the cold polar life in ‘Arctic’, the rich lagoon and backwaters in ‘Lagoon Alive’, the island paradise in ‘Mystery in the clouds’. The second category spins stories around individual animals like the tiger in ‘Tigerland’, the vulture in ‘Chipkoo, the willful vulture’, animal and bird species in ‘The Dam’, insects, creepies and crawlies in ‘Underground’, the elephant in ‘Oh To Be In Captivity’, the rhinoceros in ‘Rhino In The River’. Each story is based on a theme that will certainly interest everyone. Readers can discover the diverse birds, animals, and insects that are predominant in a terrain. Visualizing becomes easy with the adept narration. It’s a mini-paedia (mini encyclopaedia) presenting micro details. The detailed descriptions about the tiger and vulture give a comprehensive picture and lesser known facts about these familiar animals. Stories about the sea and its inhabitants are interestingly spun to explore the underwater creatures, their perils, threats, and challenges. Reading these stories generates a concern for earth, its life, and sustenance. Young readers will not only understand but also enjoy the richness of life on the blue planet and the underlying responsibility in preserving it. The objectives of EVS textbooks will be achieved by reading Bagli’s stories. The happenings are portrayed so well. The correct use of language describes situations very well. One becomes familiar with numerous birds, animals and insects living in a particular region. The well-worded descriptions about the movement of life are so striking that one experiences the same without straining the brain. The textual expressions have photographed life very realistically. The reader is actually transported into the real world. All stories feature life in the context of the topography discussed and how human beings intrude the domains of the native creatures bringing disruption, imbalance, and damage. The backdrop of every story is the crass and callous attitude of human beings. The author highlights how the abundance of earth is milked for materialistic consumption. These stories depict the ‘non-social behaviour’ of the so-called social beings. The thoughtlessness of human beings is accentuated in the conversations between animals and birds. Human beings have proved to be the greatest predators. Bagli also reminds us that man cannot survive without the animals, birds, and natural resources. However, it is not all a bleak picture that Bagli paints. Amidst all the destruction we are causing, there are some of us who are like rays of light shining through dark clouds. There is the story of Bijli Kaka who rescued a baby blue whale, Ramu Kaka who brought back the elephants, Balwir the forest warden, who performed the miracle of uniting a young rhino with its mother, and Urvashi who restored Daryagam, the seaside village. These stories will definitely create a flutter in the minds of readers and make them environmentally sensitive. 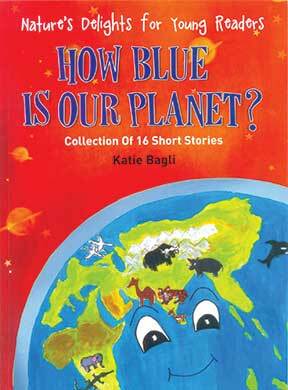 Through her stories, Bagli urges us to resolve to preserve our blue planet, heal the world and not exploit it. This is certainly a book you would love to have in your library. The reviewer is Senior Principal, Mahatma Gandhi International School, Cuddalore. She can be reached at stellappunitha@gmail.com.